Friends, I'm so pumped up today. I've got some pretty exciting projects on the horizon that I can't wait to kick off. The biggest problem I seem to be having at the moment is a lack of hours in the day to produce things, and that is a good problem to have. I'm having an intensely optimistic week as things seem to be falling into place. It's good stuff. I've got two poster designs on the brain. 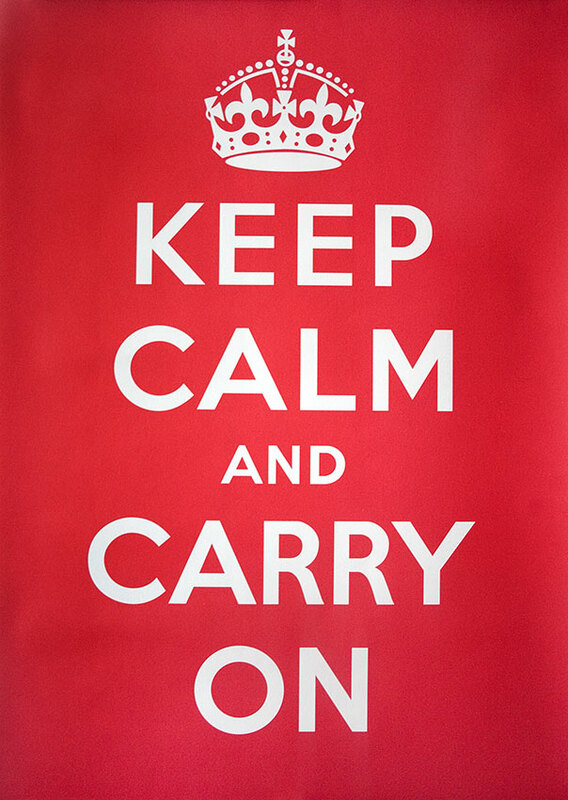 The now ubiquitous "Keep Calm & Carry On" poster for one, which I'm sure you know about by now because it's been all over the place for a few years. It's a good message because too often in life we get caught up in the craziness and forget how truly lucky we are. 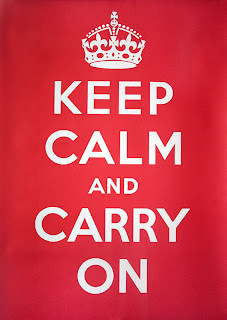 And further to that, it's a good message for any workplace because even small crises are usually manageable if one stays calm and stays the course of their goals. But there's another one that is a take-off of it that comes to mind too and it really seems to be something that is working for me lately. 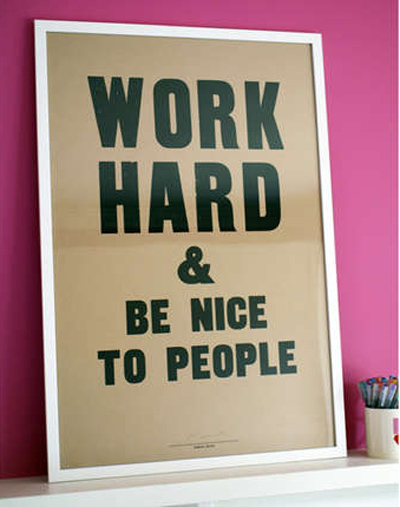 That's the "Work Hard & Be Nice to People" version. 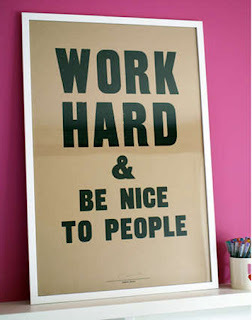 It's a mantra for me really, because I don't know what other approach to take in life. Sometimes you are rewarded for this approach and sometimes people take it for granted. I've learned that if people take it for granted, they aren't the right people to be working for. The past year has been one of intense change of direction. I gave up a desirable career and some money in order to have moral and personal fulfillment in my work, and while the decision seemed hard at the time, in retrospect the choice seems to have been a no-brainer. It's easy when I consider all that I've gained. Further to that, new opportunity keeps coming my way. It seems the more effort I put in, the more hard work I do (sometimes for little or next to no pay) the better the opportunities are. So long as the bills are paid, I'm not even that concerned about the money. (Though, I wouldn't say no to more, lets be honest here...) The point is, life is bigger than a paycheque, and the liberation in realizing that fact has been so profound, I can't imagine how I ever got through my day-to-day otherwise. I guess I'm one of the artist types I write about in my column this week. Here it is. You often hear in the mainstream media about high dollar sales of artwork, rich and famous musicians, the big blockbuster shows and names. But the reality of being a working artist of any kind is very different. Artists hustle, often undertaking numerous business ventures and seeking opportunities in various career fields in order to keep themselves financially afloat. It is a passion for the craft that motivates and inspires, not cash payouts and fame. Though I’m sure many artists and musicians would love to earn more money for their creations, thus allowing them more time and freedom to create, I think many would say the act of creating is the greatest reward, outweighing any financial benefit. This very attitude must be the reason that so many are driven to give back to their communities by donating their creative skills. With momentum gaining in the local creative community, a number of ventures are coming up in Oshawa, encompassing both art and music together in order to support causes worthy of the attention. In early February the Robert McLaughlin Gallery (RMG) introduces First Fridays, hosted on the first Friday of the months February, March, April and May. The pilot project brings together musicians who have donated their time and talent to help the RMG build awareness in the community about the art gallery. Donations at the event support War Child Canada, and in return War Child Canada helps bring regional and national attention to our local gallery gem. It’s a win-win, and the community benefits; it’s free to attend. Feb. 4 local acoustic soul performer Gibbran is the featured act, while March brings Ajax’s Forest City Lovers to play. April features Mandi J Byrd and the Hamilton Trading Company, both based out of Toronto but with a shared connection to Oshawa. In May, nationally-recognized sound installation artist Gordon Monahan performs. Friends of the Second Marsh are hosting an art event on Feb. 26; photographers are invited to the marsh to capture the wetlands in winter. Designed to raise awareness about the marsh and create a sense of community stewardship over this important ecological locale, the “Day in the Life of the Second Marsh” project is fully volunteer run. Photographers will be offered space to display what they have captured in various venues downtown Oshawa. There is sure to be musical participation during the showings, as local music aficionados are organizing this one. Contact mcguirkwill@gmail.com for details on how to participate. Connecting, collaborating and finding new audiences for their work is a valuable bonus to those who have donated creative time, energy and skill to these events. In turn, grassroots campaigns build community partnerships and goodwill. Participation by artists and musicians is not enough; the key for events such as these is the community at large coming out to offer support. In return, the community is engaged, enlightened and entertained.